I have some quick swatches for you for my Day 2: Yellow fill for the 30 Days of Colour Challenge. 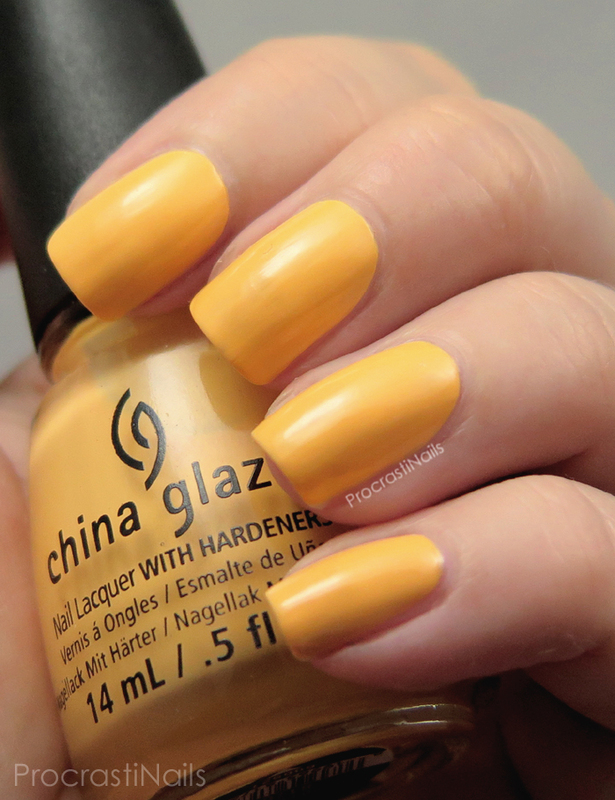 I decided to go with the lovely and buttery China Glaze Metro Pollen-Tin from the 2014 City Flourish Collection! In real life this polish is closer to what shows on the nail, not what shows in the bottle - it has a slight orange undertone to it which makes it more unique imo! It also dried slightly matte so for these pictures I did add a layer of top coat. I don't have a lot of yellow polishes in my collection but one thing I do find is that almost all of the yellows I do have (including this one) apply a bit patchy. Isn't that weird! It doesn't show as much on the nail here but this was a bit of a pain to apply. Even with three coats it didn't fully cover all the spots. The colour is buttery and lovely but the application is not. :( Ah well, at least I can enjoy the colour! 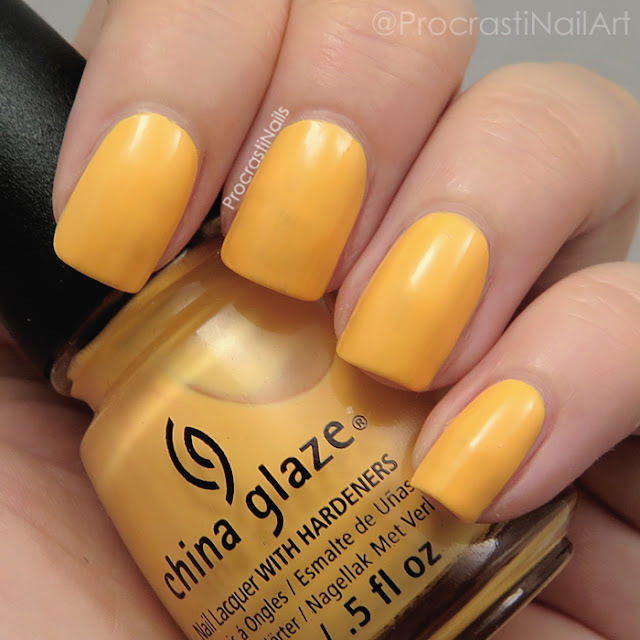 I also once heard this polish described as "nacho cheese" but I think it's more "buttery yellow" (and I like how that sounds better)... What do you think? Nachos, butter, or should we all just stop referring to polishes with food names, period? Hahah. Check out all of the other fills for today's theme, and I'll see you later today (or maybe tomorrow morning, more likely) with my next fill! This is a great shade of yellow. This is a very nice shade. I hate yellow formulas but love yellow nails, it's like to universe is against me on this one lol. Most of my yellows do the same thing. Pains to apply! I do have a couple good ones though that are my go tos! I can see this being compared to nachos lol! Aaaaand now I'm hungry! I'm going to have to go with nachos only because these are making me hungry lol. The shade is really pretty either way. I think I have it but never have used it lol. Gahh, I really want this polish and nachos haha! It's a unique shade of yellow though, slightly orangey. It looks nice on you! Yay for nachos, it totally reminds me of them! Love that it's so unusual!